The Skelesentry is definitely one of my more improvised drawings as I basically was drawing from a rough sketch I abandoned and just ran with basic details to see what clicks. Then I went over the drawing with a brush pen and just improvised A LOT of the details on this creation. The core body, I based it off of a Summon design from Persona, then ran with the plating on the rest of the body while concealing any inconsistencies using the brush pen for detailing. I then added the fannels around its forearms and shins for additional defense. The unusual feet designs is another trope I borrowed from the Persona series as a great deal of their designs have this weird feet that eschew the traditional foot ware in most designs a most likely found in goth or fashion ware with the heels pointing away from the ground with a bizarre sole for balance. The halberd is a combination of a shell blade and a ridged falchion blade with an improvised pommel. 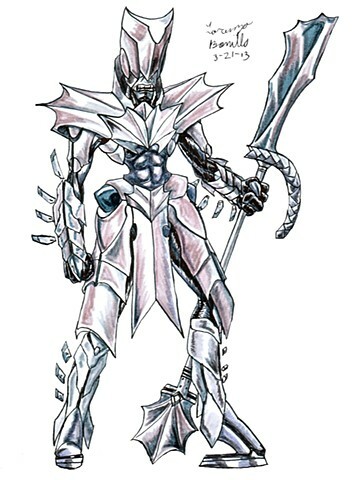 The Skelesentry serves a a high defense Summon spirit using the fannels as an all-encompassing shield and delivering heavy melee strikes with its halberd. Plus, the heavy armor makes it extra tough to deal any damage to it. course, you have to get close to actually deliver a hit.